UPDATE: In fact I’m now trialling Xfce once again for my primary desktop because it satisfies all the criteria I outlined below as well as GNOME does, while being much more light weight. It’s funny, I’m really only this fickle when it comes to software! With a somewhat heavy heart and conscience I moved my primary desktop from KDE to GNOME this week. Yes, that's CC from Code Geass, the anime series Felix and I are watching! While I think I still prefer KDE as a desktop environment, I think Gnome is more practical for what I do right now. 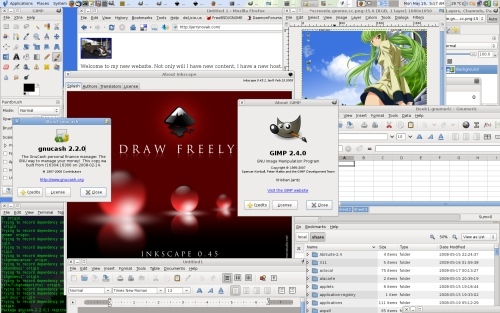 Aside from Amarok and Ktorrent, virtually all the applications I use on a daily basis are GTK+ based, such as Gnumeric, Abiword, The Gimp, Gnucash, gEdit, Thunar (from Xfce, another nice DE), Firefox, Thunderbird… I could go on. It is really nice to have a consistent user interface for the first time, where my applications and the desktop work and look the same. Having used GTK+ applications on KDE and Mac OS X for many, many years, it's certainly a refreshing experience. On the whole I also prefer the simple design methodology behind a lot of what the GNOME people are doing. Despite Linus Torvald's vocal opposition to it, I believe working hard to make interfaces simpler is an admiral goal. I've still got KDE 3.5.9 on my Athlon XP desktop, but I guess I could say I'm a GNOME user now. For what it's worth, this is another reason why I love using free and open source software, if I don't like a particular user interface or environment, or I choose to use a another one, it is completely in my power to just slot in a different one. It's fantastic!